The following is a guest post by Alan Oppenheimer. The Alan and Priscilla Oppenheimer Foundation seeks to advance humanity through scientific research and education and has been a long-time supporter of the Harvard Personal Genome Project. The views of this guest post, and responses from participants reported upon here, do not necessarily reflect the views of the Harvard Personal Genome Project. It is important to keep in mind that the Harvard Personal Genome Project study is not intended nor expected to help participants diagnose or improve personal health issues. Following up on our previous blog post, here’s a quick summary of the results of the Harvard Personal Genome Project enrollee survey “What are you looking for in your genome, and how can we help you find it?” There were about 280 respondents. The first questions were about the participant’s background. The “average” participant has been in PGP about 3 years, may or may not have donated a sample, is most interested in inherited disease risk, has 23andMe or FamilyTree/Ancestry DNA data, and is very computer savvy, reading articles/journals. 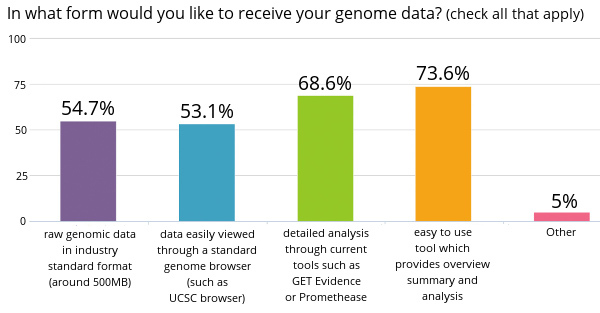 In terms of the key question in the title of the survey, participants would slightly prefer their genome analysis through either current tools like GET-Evidence and Promethease or an easy-to-use overview tool, versus raw data or a genome browser (see figure below). Primary important factors in exploring their genome include medical analysis and broad, flexible in-depth data, both slightly favored over ease-of-use and accessibility of an overview (and significantly favored over the ability to share/compare with family members). Thanks to everyone who took part. Our next step after this survey: decide on what tool(s) we here at the Oppenheimer Foundation should start building (or assisting the Personal Genome Project with) to best address the survey responses.